"Why is everyone constantly quoting me?" "Brakes don't work worth a damn when you're upside down." "Man is the only animal that can be skinned more than once"
A doughnut with no hole is a Danish! 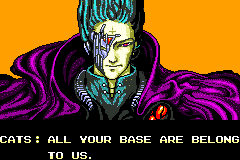 "All your base are belong to us"! What old fart can tell me where this one came from - hint, it is not a person. So now we’re quoting poor English from old video games...sweet! 3) "I move around a lot, not because I'm looking for anything really, but because I'm getting away from things that get bad if I stay." "My right leg is Christmas and my left leg is New Year's Day. Why don't you come up visit me between the holidays?"